CORNER Ocean FRONT Condo ~ Valley Isle #310 ~ Best Location on Property! 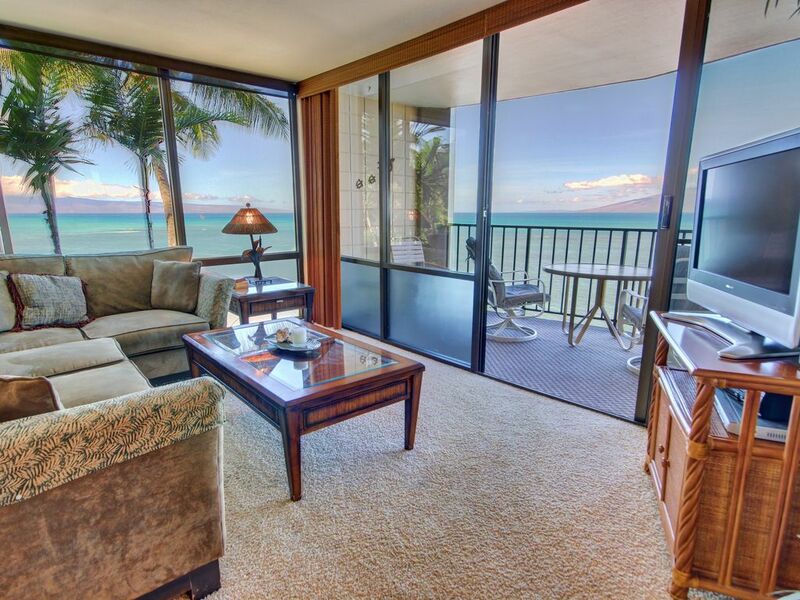 Corner ocean front condo with panoramic ocean views in Kahana. Enjoy ocean front views from the lanai off of the living room and master bedroom. A flat screen TV coupled with the DVD player keeps you entertained in the evenings. Bring your CD's from home and listen on the player provided. Bring your laptop and enjoy free cable high speed internet access. Roll down shades in the living room provide afternoon shade. •A whales' baby (calf) , born here on Maui, grow at a rate of 100 pounds a day! Consistently voted the #1 island in the world, Maui has endless activities for vacationers, from fabulous beaches to fantastic dining and nightlife! Located on the northwest side of the island, Lahaina is a tropical paradise blending a rich history with modern Maui. Chase’ N Rainbows Real Estate offers you the finest collection of hand-picked Maui condo rentals in the popular areas of West Maui. Each vacation rental property is professionally managed and superbly maintained to the highest standards. Offering views of the beautiful West Maui Mountains and across the pristine islands of Lanai and Molokai. Come see all that Maui has to offer! A sunset cruise around the island makes for a perfect romantic evening. If you’re curious about what goes on under the waves, snorkeling tours are a great way to view the incredible variety of life that lives under the surface of the ocean. If you don’t want to get wet, there’s even a submarine that can take you into the deeps while you view its mysteries from the comfort of a climate controlled cabin. Helicopter tours are an excellent way to take in views of the whole island, including incredible waterfalls, sea cliffs and forests you would be hard pressed to view on foot. For those looking for a little more excitement, you can take an ATV tour or Zip-line adventure, drive the road to beautiful Hana or watch the sunrise from Haleakala. Enjoy Maui's fabulous luaus, restaurants, shops, art galleries and spas! 6 bath towels, 4 hand towels and 4 wash cloths for each bathroom provided. Beds will be made up for arrival. The condo was great, but,,, the beach. Not so much. The condo itself is wonderful. I’ve stayed at Valley Isles three times. However, I should have been told the beach presently has no access and the whole beachside was sandbagged. I walk with a cane and to get to the beach I had to cross a rocky creek. I should have been told this up front. Though I love the place, I would have gone elsewhere. I think the owners hid this information so they could rent. Very disappointing. Aloha Sheryl: Mahalo for the time you took to post and write this review. I would like to clarify that we did in fact notify you about the shoreline conditions several times along your booking process and it was also listed in the VRBO listing, we are sorry you missed them.